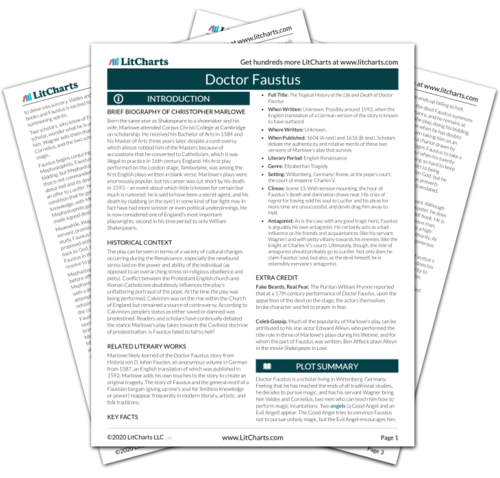 Instant downloads of all 942 LitChart PDFs (including Doctor Faustus). Faustus enters, looking up at the night sky as a thunderstorm rages. Faustus describes how he has prayed and sacrificed to the devils, drawing circles, signs and anagrams. (In the B-Text, Lucifer and some devils are on-stage to hear this.) He begins his Latin incantation, calling a number of devils by name, including Mephastophilis. Faustus' incantation is a complicated matter, requiring knowledge and time spent studying spells. Magic is thus not some innate ability, but a field of study that requires specific knowledge, in some ways similar to the subjects Faustus has spent his life studying at university. One devil, Mephastophilis, appears before Faustus, who immediately commands him to leave and come back in a different shape: “Thou are too ugly to attend on me” (3, 26). He jokingly suggests a Franciscan friar, since “that holy shape becomes a devil best” (3, 28). The devil exits, and Faustus marvels at how obedient he is. The joke at the expense of friars is both a cheap shot at Catholics (unpopular in 16th century England) and an example of Faustus' skepticism toward religion, a sign of his Renaissance individualism. Faustus exults in the power he has over Mephastophilis. Mephastophilis re-enters and asks Faustus what he wants him to do. Faustus commands him to wait on him, to do whatever he tells him to do, but Mephastophilis replies that he can't obey without Lucifer's permission. Faustus asks if Mephastophilis came because Lucifer ordered him to. Mephastophilis says no. Faustus then asks if his conjuring made Mephastophilis appear. Again, Mephastophilis says no. He explains that devils go to anyone who renounces God and Christ in the hopes of getting the person's soul. This is what has drawn Mephastophilis to Faustus. Faustus at first has trouble understanding the hierarchy of hell. Initially Faustus seems to believe that his knowledge of necromancy has made Mephastophilis into his servant. But Mephastophilis answers'—that he came neither at Lucifer's nor Faustus' command, but rather because he comes to anyone who seems ready to renounce God—turns that idea on its head. Mephastophilis is there, and willing to give Faustus power, in order to get Faustus to damn himself. Faustus asks Mephastophilis about Lucifer and the fallen angels: why they fell, where they are damned, and how they can be outside Hell. Mephastophilis explains that Lucifer and other angels were expelled from heaven for their pride and insolence. Hell follows them; it is a state of mind rather than a literal place. He begs Faustus to stop questioning him, since the memory of being cast out of heaven is painful, and Faustus cruelly mocks him for his misery. Faustus' first concern is to expand his knowledge and learn more about hell. Mephastophilis' pain at speaking about Lucifer's fall from heaven shows the suffering caused by sin without redemption, an example that Faustus is not only too arrogant to heed but actually mocks. Faustus cannot comprehend what hell is like at this point. He can only imagine the power he is to gain. Faustus tells Mephastophilis to propose a deal to Lucifer: Faustus will give Lucifer his soul in return for 24 years with Mephastophilis as his servant. Mephastophilis vows to confer with Lucifer and return with news. Faustus delivers a soliloquy, reaffirming that he thinks the deal is worth the power he will get through Mephastophilis and saying, “Had I as many souls as there be stars / I'd give them all for Mephastophilis” (3, 101-2). Faustus himself comes up with the idea of the bargain. But is his supposedly free will really just predetermined by God? Regardless, Faustus is pleased with the deal; he clearly does not know the value of his own soul. Fredericksen, Erik. "Doctor Faustus Scene 3." LitCharts. LitCharts LLC, 3 Nov 2013. Web. 20 Apr 2019. Fredericksen, Erik. "Doctor Faustus Scene 3." LitCharts LLC, November 3, 2013. 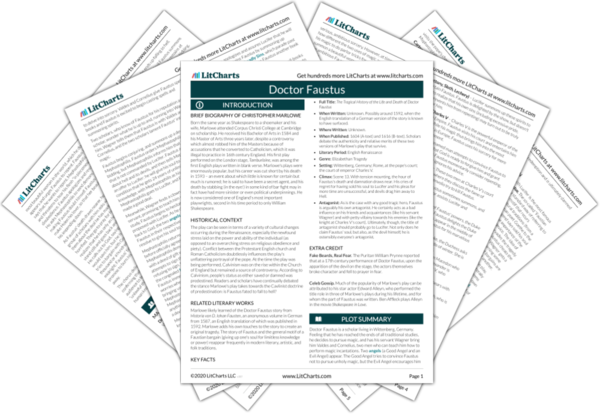 Retrieved April 20, 2019. https://www.litcharts.com/lit/doctor-faustus/scene-3.